Last month we published a blog post about GoTriangle’s Supplemental Environmental Assessment. That post goes into detail about our thoughts but we also submitted a public comment to the Federal Transit Administration on behalf of the organization. The full text of our public comment is below. GoTriangle has released its latest designs of Durham and Orange Counties’ future light rail system. The agency held open houses earlier this month; if you missed those, you can participate online. 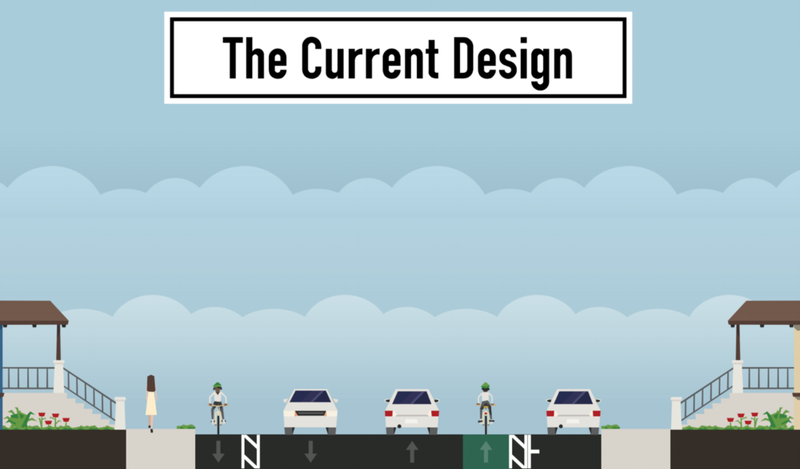 Bike Durham needs you to comment on this project to ensure the final design is part of a cohesive transportation network in downtown Durham. Bike Durham has been enthusiastically supportive of this transformational project as long as we have been an organization. The future of Durham needs a strong transit backbone to ensure there are options for people to get around other than driving. The latest designs reflect improved pedestrian and bicycle access for stations outside of downtown and also a much needed additional station in front of the Durham Performing Art Center. The project is closing in on final agreements and filling the remaining funding gaps that will hopefully propel it towards construction. The latest iteration proposes to close the crossing of the train tracks at Blackwell Street to all traffic and transportation modes. This means that people walking and biking between downtown and the American Tobacco Campus, American Tobacco Trail, and Durham Bulls stadium would have their access severely reduced. Anyone trying to catch a train or a bus at the new Durham light rail station would be impeded from doing so. The street closure will also create more circuitous routing for key bus lines with high ridership traveling between East Durham and Durham Station. The Indy Week covered the issue in great detail. The proposal of a “signature crossing”, essentially a pedestrian and bicyclist bridge, does not sufficiently address these issues; if you are rushing to make your bus or train, the last thing you want to have to do is climb a very long, circuitous path to get there, thereby undermining the entire point of the project for its two most important stations (the new Blackwell/Mangum station and the Durham Transit Station). 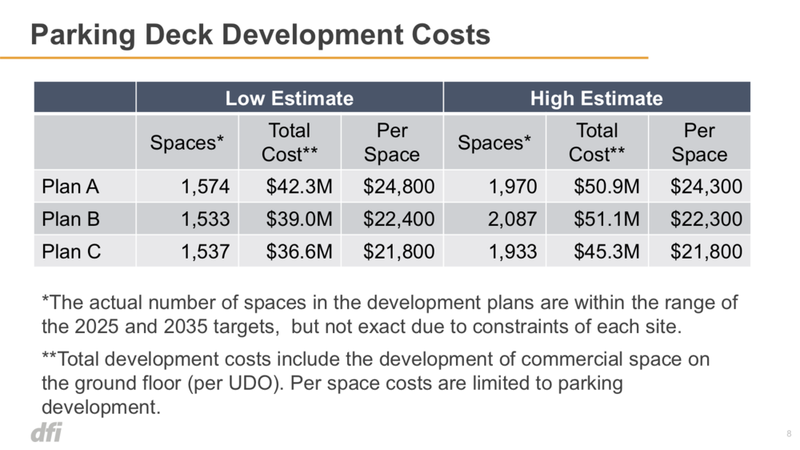 This is an unacceptable outcome for a project that has already spent nearly $100 million on design and will cost more than $2.5 billion overall. In the near term, maintain the at-grade rail crossing on Blackwell Street for people walking and biking. 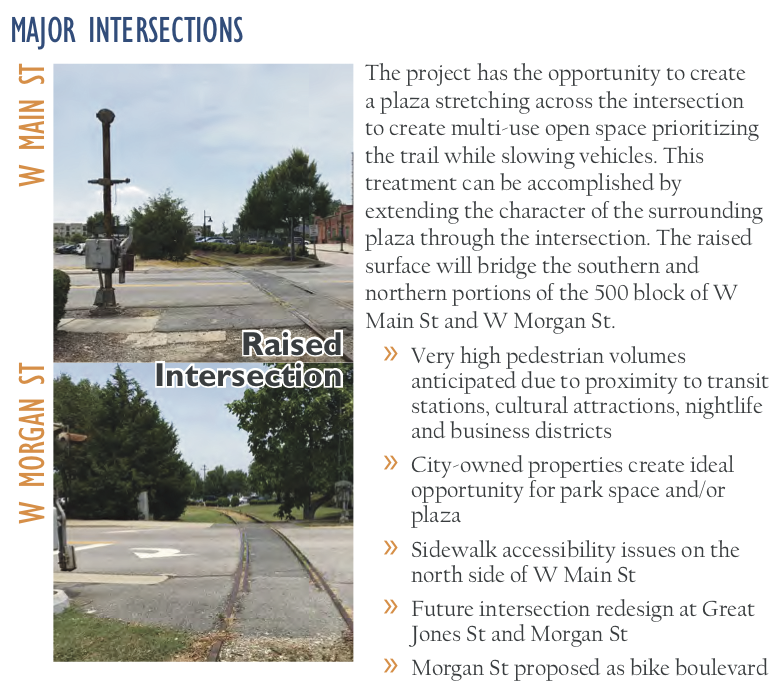 This condition already exists today and would be similar to what is being proposed one block away for Mangum Street (Mangum will remain open to all vehicles). Maintaining access for people walking and biking does not have the same engineering challenges that the crossing does for motorized vehicles. It also doesn’t introduce any additional costs to the project. During final design of the project, we encourage the North Carolina Department of Transportation (NCDOT) and the North Carolina Railroad (NCRR) to study a separate improvement project to raise the tracks such that both Mangum and Blackwell could pass underneath. 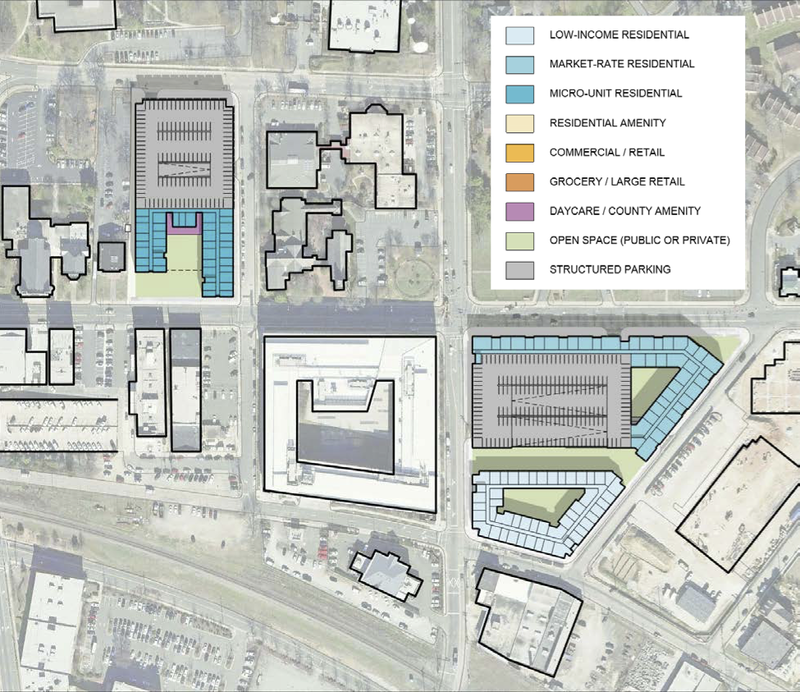 This is an improvement that would need to happen regardless of the Light Rail project due to the increased number of people living, working, playing, and shopping in downtown Durham. Finally, this long-term improvement would create more direct routing for bus lines that currently rely on this crossing. Most stakeholders involved in the project would be happy with the above set of solutions. Unfortunately, the North Carolina Railroad (NCRR) is not one of them. Even more unfortunate is the fact that they own the rail right of way at the crossing. This effectively means that they have the power to force GoTriangle to close Blackwell Street by withholding their agreement to allow the Light Rail project to operate next to the existing rail tracks. NCRR has flatly refused to consider keeping the Blackwell crossing open for people walking and biking, declaring it a “new at-grade” crossing even though this very same crossing already exists today. The NCRR is operated as a private company, but it is 100% owned by the taxpayers of North Carolina, and their board is appointed by the governor (7 seats) and the state legislature (3 seats from the House and 3 seats from the Senate). Therefore, they need to hear from you, their shareholders, that they are not representing you properly. You can read Bike Durham’s full comment letter here. The comment period has closed for this project. To be notified earlier about pressing advocacy, sign up for our monthly newsletter below. I am 100% supportive of the GoTriangle light rail project and can't wait to see it get implemented. However, this project must maintain the pedestrian and bicycle crossing of the tracks on Blackwell Street. Please do not undermine the purpose of the project by reducing access for this critical connection to the light rail system from downtown, which a pedestrian bridge of this length would certainly do. Additionally, the project must not cut off this key connection to the American Tobacco Campus and American Tobacco Trail. In the long run, I urge NCDOT and NCRR to study elevating the tracks through downtown which is necessary whether or not the light rail is built to increase rail capacity. Please include your name and street address in the email. Although it’s not required, a personal story or detail about why preserving the Blackwell Street connection is important to you or how you’re excited for the light rail project helps your letter stand out. The roughly 10 new miles of bike lanes for 2018 are seen here in orange. Existing greenways and bike lanes can be seen in green and blue, respectively. Durham is in the beginning stages of implementing its Bike+Walk plan adopted in 2017. The plan was meant to update and combine previous plans from over a decade ago with a stronger focus on safety to encourage bicycling and walking. About 10 miles of roads were identified in 2018 as priorities for new bicycling infrastructure and the city has published preliminary designs for what we can expect to see for each of the projects. This collection of projects is one of the first real tests of whether Durham is going to treat bicycling as a serious form of transportation going forward and protect the people using it. The best way we can evaluate these projects against the goals of the Bike+Walk plan is to examine whether they are adhering to the best practices demonstrated by other cities. Durham is not the first American city to attempt to improve bicycling infrastructure and therefore has the benefit of learning from years of experience that professionals across the country have acquired through their own implementations. These lessons and best practices were codified by the National Association of City Transportation Officials, or simply NACTO, in their Urban Bikeway Design Guide, first published in 2011 and updated over the years. The authors of the Bike+Walk plan referenced this guide and stated that it should be continuously used for any design efforts going forward. NACTO’s guide makes specific recommendations about design elements that are necessary for the comfort and safety of bicyclists using the facilities. If Durham is going to build a network of bicycling infrastructure that accommodates people of all ages and abilities, we need to adhere to these principles. The 10 projects featured on the city’s website all share similar design decisions that need to be improved on. It is important to note that these are all re-striping projects paid for by a combination of local and federal funds. This means that instead of a complete reconstructing of the street, we are essentially limited to a reprogramming of the lines on the road. However, even more important to note is that NACTO’s guide reveals that even just re-striping the road and introducing low-cost physical elements can dramatically change the feel of the road and increase safety for everyone using it. The published designs begin the process of reallocating street space by narrowing lanes for traveling cars and introducing bike lanes. Several of the bike lanes, like those on Lakewood Avenue and Raynor Street, are placed directly next to motor vehicle travel lanes while others, like those on Cornwallis Road and Chapel Hill Road, feature fairly wide buffers to give bicyclists some breathing room. Given low enough vehicle speeds and daily volume of traffic, some of these designs would be considered sufficient to provide a level of comfort that would be acceptable by the average bicyclist. However, all of these roads have posted speed limits of 25mph or higher, the speed at which NACTO begins to stress that bicyclists need to be physically separated from car traffic. Physical separation is critical at these speeds because the risk of a serious injury or fatality if a cyclist is struck increases significantly. If the goal of expanding the bicycle network is to promote bicycling as a mode of transportation then the safety and comfort of people in the bike lanes should be the focus. There are minimum requirements for how much road width you need to introduce physical protection elements. Studies also reveal that narrower lane widths promote slower driving speeds, which leads to safety benefits for all users. And more importantly, narrowing the travel lanes gives the engineers more room to introduce physical protection elements for the bike lanes. Therefore all of the designs should feature 10’ driving lanes, as opposed to the proposed 11’ lanes, so more of the street space can be allocated to bike lanes and elements to physically protect them. Designs are always impacted by local considerations but at the very minimum they should be adhering to the NACTO standards. And for all the bicycle improvements we’re being asked to consider in 2018, that means we should be adding physical separation. This way anyone in Durham who wants to ride a bike on these roads can feel safe doing so. If there is a shortage of funding to bring any of these projects into compliance with the NACTO standards, then we should be demanding to know the cost of introducing protected bike lanes. The public needs to know the dollar amount so citizens and City Council can make an informed decision and allocate the necessary funding to achieve compliance with NACTO standards and provide residents with a safe and accommodating bicycling network that Durham can be proud of. The city is hosting a meeting this Saturday, September 22nd, at the Whitted School from 10am to 1pm. It’s a drop-in style meeting so you can show up anytime during the three hour session to review the designs and share your thoughts with city planners and engineers. The most effective thing you can do is show up in person and make your voice heard. We think it’s particularly important that the bikes lanes be protected and if we demand to know the cost of doing so, we are confident that decision makers will be able to find the funding to make truly safe bicycling infrastructure a reality in Durham. All of the projects at the meeting have design speeds of 25mph or over and therefore standards dictate that bicyclists be physically separated from car traffic. Broad Street is being resurfaced by NCDOT this summer. The Transportation Department, in collaboration with Alta Planning + Design, is taking this opportunity to re-stripe the street to improve safety for all users. Broad Street is a key link in the bicycle network in Durham, connecting important destinations like Duke’s East Campus, the North Carolina School of Science and Math and commercial districts along the street. It would also connect to bike lanes further north on Broad Street, and to ones on Main Street and Club Boulevard. The project is moving very quickly and you should know about a critical issue with designs proposed by staff. Bike Durham has followed this design process closely from the beginning. Two of the three initial designs included some variation of current best practice— protected bike lanes. Protected bike lanes have been shown to increase cycling rates and reduce crash rates. Bike Durham and the larger bicycle community supported those two designs, one of which included parking-protected bike lanes— a common design for streets with retail businesses like those along Broad Street. 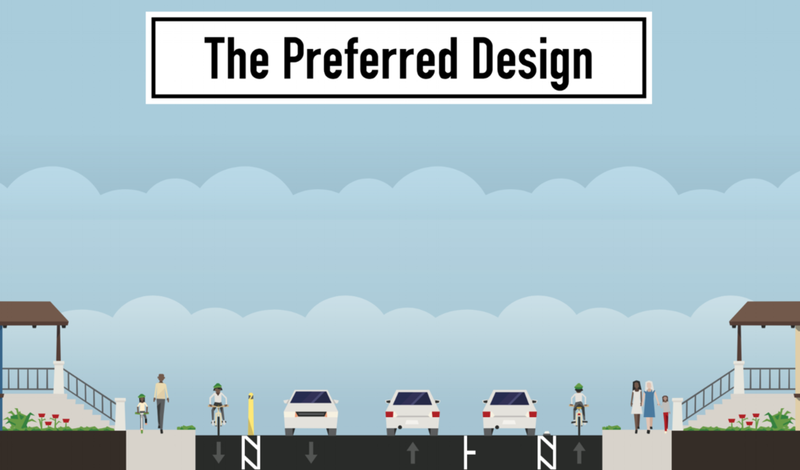 At the latest public meeting, Bike Durham and others in the bicycle community were surprised to see that neither of the preferred designs were chosen. Instead, the City advanced the only design that offered no physical protection for cyclists. While the new design does include bike lanes, they are not protected from the regular travel lanes. Additionally, the bike lanes are not carried all the way through the corridor, ending before they reach Main Street (and its bike lanes) to the south, and not continuing through the Guess Road intersection to the north. With the current design, every time someone parallel parks or double parks on Broad, a cyclist will be pushed into 35 mph traffic or faster. This design does little to help the “interested but concerned” category of cyclists feel safe on our streets. Without this group, bicycling will not become the mode of choice for Durham’s citizens. The great news is, we can increase bicycling levels and safety on Broad Street by striping the road slightly differently to create protected bike lanes throughout the entire corridor. As mentioned earlier, this design was already one of the options for Broad Street. The Transportation Department has kindly produced a memo describing their design process, including the rationale against the parking-protected lane the City initially proposed to the public. This rationale, which we contest in detail here, hinges mostly on the initial learning curve of a parking-protected lane because this design has yet to be implemented in Durham. Although parking protection is novel in Durham, the minor concerns raised by the Transportation Department have been non-issues in US and international implementations. The comment period has closed for this street. To be notified earlier about pressing advocacy, sign up for our monthly newsletter below. The Durham Belt Line is a visionary project that borrows ideas from successful linear parks like the High Line in New York City and multi-use trails like the BeltLine in Atlanta. What makes the Durham Belt Line innovative is that not only will it act as a green and public place for the exchange of ideas and culture, it will create a valuable transportation connection for Durham residents traveling on foot or by bike. 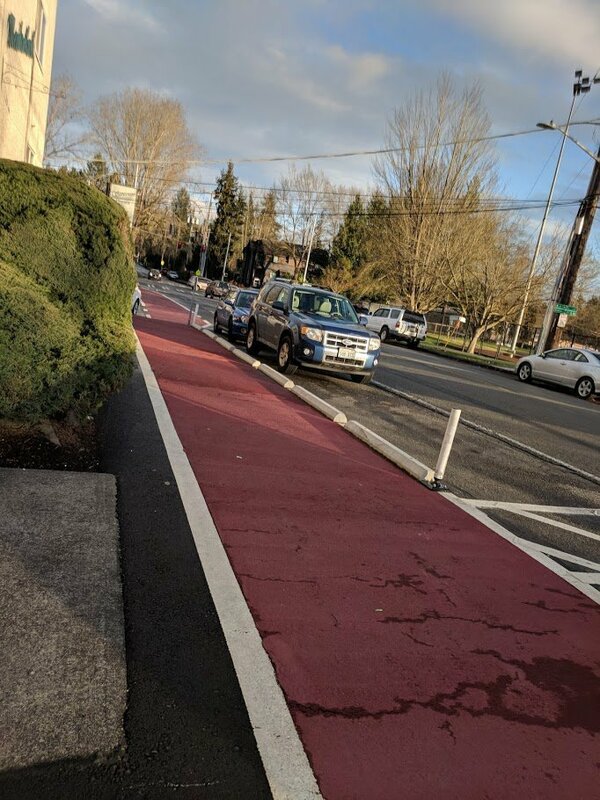 We always advocate for physical separation of motor vehicles and bicyclists on public streets because different users that travel at different speeds work best when they’re given their own dedicated space to travel, and vulnerable bicyclists can expect a level of safety that mere paint does not afford them. This very same principle applies between bicyclists and pedestrians and the preferred design of the Belt Line conforms to this ideal wherever possible. The trail gives bicyclists a great deal of space to bike without the need to navigate joggers and walkers and vice versa. At its widest, the bi-directional cycle path will be 12 feet across giving slower bicyclists plenty of space to meander while faster bicyclists will have enough room to safely pass without needing to drift into the oncoming lane. The best part about six foot wide travel lanes for bicyclists is that they’re not only sufficient for momentarily passing one other but they’re the minimum recommended width for bicyclists to comfortably travel side by side. This is fantastic for social bicycling, an activity that people tend to associate with the isolated road warrior or commuter. Promoting social bicycling can also help to diversify the demographics of bicyclists in Durham because studies have revealed a preference by Black and Hispanic residents to bike with family and friends. Unfortunately due to right-of-way constraints, the preferred cross section isn’t always possible. We ask that the designs at least be re-evaluated to find a way to maintain consistency so that users on all stretches of the park have an opportunity to experience the best possible designs. If we are to expand alternative and affordable transportation in Durham, we need to ensure consistency between all segments of the trail. The Belt Line has a number of at-grade crossings that need to be designed with care. Roxboro St in particular is dangerous because it has been designed for speed and thus many drivers on the stretch of road where the Belt Line will cross have been measured traveling well above the speed limit on that road. At these speeds, a driver hitting a pedestrian or a cyclist with their car has a near-certain chance of killing them. The project already incorporates some best practices like a raised crosswalk at Main St and Morgan St but fails to do so at Roxboro St and other intersections where the consequences of a collision are deadlier. We’re glad that the designs have embraced these techniques but the Belt Line will be most effective if the experience of using it is consistent. We recommend that the designs incorporate all of the best practices at all of the crossings to maximize the protection of those using the trail, especially when the stark contrast between the safety of the trail and the danger of the roads is greatest. Finally, the Belt Line does not exist in a bubble. People still need to be able to reach the perimeter of the park in a safe and accessible manner. Once completed, the park will increase the number of Durham households with access to green space by 52%. This is really important for the equity of Durham’s public spaces but that equity will be wasted without a means by which residents of each neighborhood can access the park. The designs acknowledge this and have plans to improve sidewalks and transit stops along the trail but more can always be done. Once a bicyclist exits the park, they need to feed into bike connections that can maintain a consistent and comparable level of safety and comfort. We ask that the project team work closely with the Department of Transportation to expedite any future planned connections and generate new bike and pedestrian projects that can ensure accessibility to the Belt Line beyond just residents’ geographic proximity. We also need to understand that with increased public amenities come increased financial pressures for the communities surrounding the proposed trail. We believe that all people, regardless of socioeconomic standing, deserve access to affordable transportation options and public spaces that facilitate cultural enrichment. However there are economic realities that residents will face when their neighborhoods, long starved of these facilities, suddenly become infused with private investment. We can't allow the Belt Line to act as a catalyst for displacement and the city needs to focus their efforts on maintaining housing affordability. The Belt Line Master Plan should be amended with creative strategies like value capture to raise funds for affordable housing. 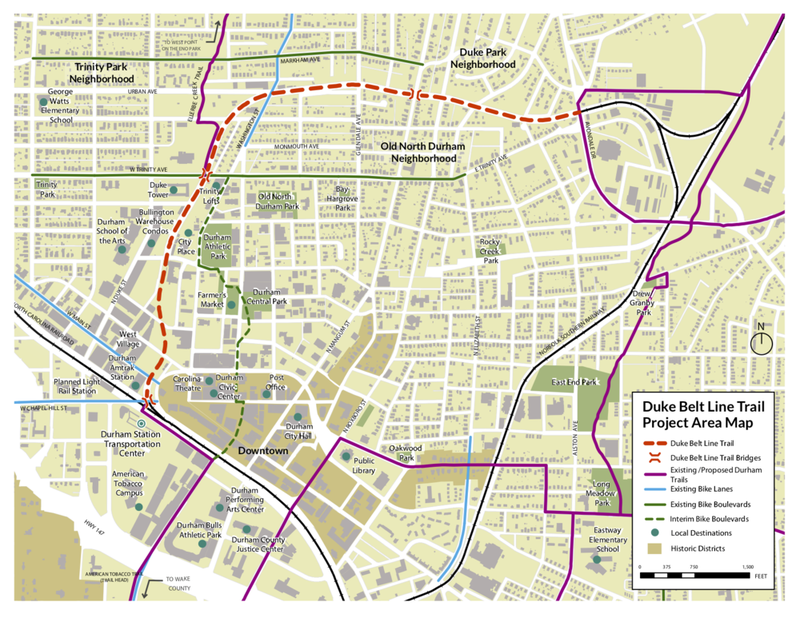 Durham must ensure that all Durham residents can enjoy the benefits of the Belt Line. 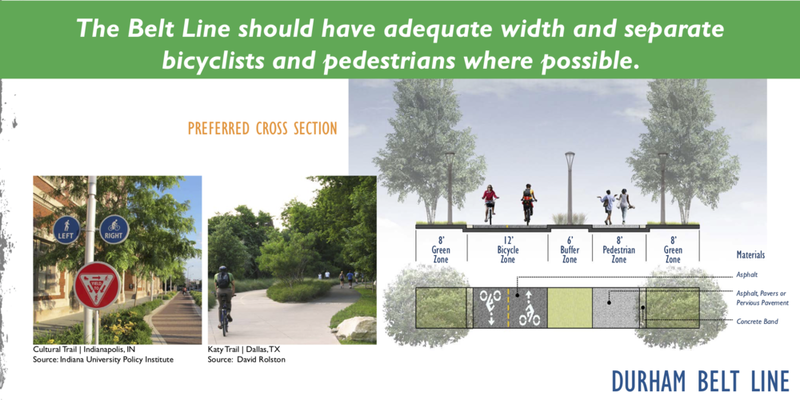 The designs should re-evaluate the sections of the Belt Line that have been identified as too constrained to maintain the preferred cross section and instead be configured to maintain a consistently ideal experience for both bicyclists and pedestrians. Road crossings need to be designed to prioritize the safety of trail users by adhering to identified best practices and maintaining a consistent feel through the crossing. Connections to the trail should feed into and out of the Belt Line in a safe and comfortable manner to maximize the accessibility of the trail so it can be used by everyone. The Belt Line Master Plan should make commitments to keep housing affordable in all the neighborhoods surrounding the trail. As part of their 2018 Bicycle Improvements, the City of Durham, with help from Alta Planning & Design, is working on the design for restriping Broad Street (Main to Guess) and South Roxboro Street (Cornwallis to Summit) to include bike lanes. These two are being done first because NCDOT plans to resurface both roads this summer. Broad Street (includes three design options and a survey). South Roxboro Street (a single option and a survey). This summer. No deadlines for initial comments or surveys have been given, but they should be provided as soon as possible. A public meeting is promised, but has not yet been scheduled. NCDOT already has contracts to resurface both roads this summer. Protected bike lanes on both sides of the street are essential on each corridor. The lanes should be carried through intersections and connect with adjacent bicycle infrastructure. Vertical delineators should be added immediately and permanent barriers should be added within two years of the restriping. Travel lanes should be narrowed to slow traffic. Bus stops should be designed to minimize conflicts between buses and cyclists. Design Options for Broad Street: Three options are presented. Option A should not be considered. 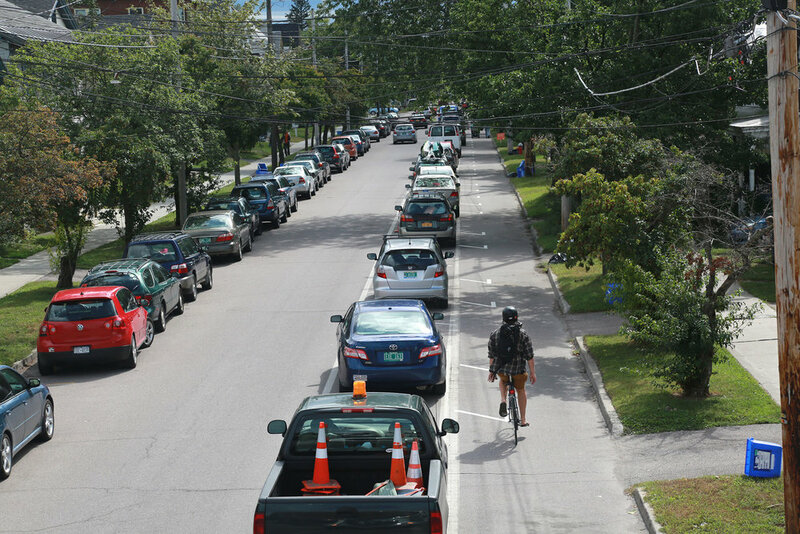 It puts cyclists in the door zone of parked cars and would not allow for protected lanes on one side of the street. Bike Durham supports Option B with one significant adjustment - if another foot can be taken from somewhere, preferably the travel lanes and/or parking lane, there could be a two foot buffer (enough for vertical delineators in the short term and a more permanent solution in the longer term) for the bike lanes not protected by parking. If the adjustment to Option B can be made to ensure protected bike lanes on both sides of the street, Option C is not necessary. We recognize that this will risk an unnecessary fight with the business owners along Broad Street who are concerned about losing on-street parking. That said, it is the only option that includes protected bike lanes on both sides as currently shown and should be considered for blocks where on-street parking is rare. Our understanding is the Option B can include protected facilities, but was simply not rendered with vertical elements. Thus, a mix of an adjusted Option B with protected bike lanes on both sides where parking is needed, and Option C where parking is not needed, would be the best of both worlds. The other option we have heard suggested by members of the community is a two-way protected cycle track. The City has indicated NCDOT would not support this design and that there would be additional signal and curb movement costs that the City has not budgeted. It also creates a tricky transition to the traditional bike lanes found at either end of the corridor. Therefore, Bike Durham does not recommend this design treatment. Bike Durham encourages the removal of turn lanes at unsignalized intersections along Broad Street to continue the bike lane protections as long as possible. Similarly, continuing the protected bike lanes through the ends of the corridor (at Main Street and Guess Road) is crucial to connect with the bike lanes on Main Street and on Broad Street north of Guess Road. While outside of the resurfacing project, the lack of bike lanes on Broad Street just north of the Guess Road intersection is a barrier to having a continuous cycling corridor along Broad Street and should be restriped to include bike lanes. 1. Every effort should be made to accommodate separated bike facilities and continuous sidewalk facilities for all of these projects. We request that staff amend conceptual designs for each of these facilities to be consistent with Durham’s Vision Zero and Sustainability policies. 2. Bike Durham would like to know the estimated additional cost and time necessary to complete the projects according to recommend standard practices. Until these crucial factors are considered we do not believe a final decision should be made by staff or City Council. 3. These projects should receive additional input from the Bicycle and Pedestrian Advisory Commission as well as Durham’s newly formed Vision Zero Technical Task Force and/or the full Vision Zero Steering Committee before approving construction. Note: If you can't get the button to work, please send an email to lee.murphy@durhamnc.gov, with Terry.Bellamy@durhamnc.gov and marvin.williams@durhamnc.gov in the cc fields, with the subject "Comment on SW-44D, SW-45D, SW-46D, and SW-47D". Please include your street address in the email.